Expect a "host of content changes." 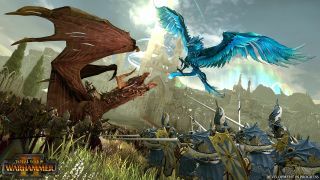 Creative Assembly has detailed the latest changes coming to The Mortal Empires: Reprisal Update beta, bringing a "host of content changes" from Warhammer 1’s Foundation Update to the Mortal Empires campaign in Warhammer 2. Changes includes Warriors of Chaos faction design changes, Wood Elf followers, and new skill trees and campaign effects for Old World Legendary Lords, plus there's also five new skill tree skills for Helman Ghorst, Old World characters can grab an immortality skill, and Bordeleaux now begins at war with Mousillon. For the full and very detailed changelist, head to the official website. To grab it, head to your Steam Library, find Total War: Warhammer II and right-click. Hit properties > betas > mortal_empires_pte. If you experience any issues, you're advised to start a new campaign, disable mods, and verify the integrity of your game files. We think Mortal Empires is one of the most ambitious updates Creative Assembly has made to a Total War game. It’s impressive and a ton of fun, but overly aggressive AI, bugs, and missing content keep Mortal Empires just shy of greatness.